The FBI is asking for the public's assistance in identifying a man believed to be responsible for 11 bank robberies. (CNN) -- A Southern California bank robber dubbed the "geezer bandit" has struck again, possibly knocking off his 11th bank, the FBI said. The suspect held up a Bank of America branch in Temecula on Thursday. "During (the) robbery, the robber approached the victim teller and presented a demand note for cash," a statement from the FBI said. "The robber carried a leather case which contained a small caliber pistol that he threatened to use, if the teller did not comply with his demands." The FBI believes the suspect is responsible for robbing 10 banks in San Diego County and one in Riverside County. The "geezer bandit" has carried a weapon in at least two of the robberies and should be considered dangerous, authorities said. "In these types of crimes, the potential for violence is significant," April Langwell, spokeswoman for the San Diego office of the FBI, said in May. "The last thing we want to happen is an employee of the bank or a customer to be injured as a result of one man's greed." 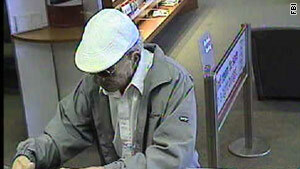 The robber has been described as between 60 and 70 years old. However, there has been some suggestion that he may be wearing a mask to conceal his real age and make him appear much older than he is, Langwell said. He is approximately 6 feet, 190 pounds, of average build and has been known to wear prescription eyeglasses and various hats and caps, including a blue baseball cap with a script style "P" on the front. CNN's Greg Morrison contributed to this report.